Gray's Reef National Marine Sanctuary off the coast of Georgia is one of the largest near-shore "live-bottom" reefs of the southeastern United States. It is just one of 14 marine protected areas that make up the National Marine Sanctuary System and is governed by the National Marine Sanctuaries Act. 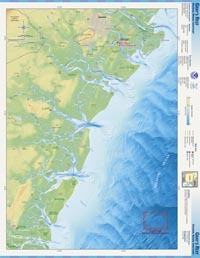 Gray's Reef National Marine Sanctuary is currently the only protected natural reef area on the continental shelf off the Georgia coast and one of only a few natural marine protected areas in the ocean between Cape Hatteras, NC and Cape Canaveral, FL. The approximately 22 square mile sanctuary (about 14,000 acres) of Gray's Reef is just a small part of the U.S. territorial Atlantic Ocean, yet its value as a natural marine habitat is recognized nationally and internationally. "Live bottom" is a term used to refer to hard or rocky seafloor that typically supports high numbers of large invertebrates such as sponges, corals and sea squirts. These spineless creatures thrive in rocky areas, as many are able to attach themselves more firmly to the hard substrate, as compared to sandy or muddy "soft" bottom habitats. Within the Gray's Reef National Marine Sanctuary there are rocky ledges with sponge and coral live bottom communities, as well as sandy bottom areas that are more typical of the seafloor off the southeastern U.S. coast. Gray's Reef is not considered a coral reef such as those found in the tropics, as its foundation was not built by living hard corals. Instead, it was formed by the cementing and consolidation of marine and terrestrial sediments (shell fragments, sand and mud) which were originally deposited as a blanket of loose grains between six and two million years ago. Some of these sediments were brought to the coast by rivers and others were probably transported to the region by ocean currents. The "cement" that glued the grains together more than 2 million years ago was briny calcium-carbonate seawater. The resulting rock that is the foundation of Gray's Reef is a carbonate-cemented sandstone. During the Pleistocene Epoch (~2 million to 10,000 years ago, and after Gray's Reef had formed) the climate oscillated between glacial ice ages and interglacial warmer periods. As a result, sea level fluctuated dramatically as glacial ice expanded (i.e., sea level fell) and melted (i.e., sea level rose). At one time, Gray's Reef was dry land! The sanctuary was periodically exposed above sea level when the shoreline was as much as 80 miles east of today's location. The fossils of large Pleistocene terrestrial animals such as mammoths have been found at the reef, indicating that either these beasts lived in the area when sea level was low, or their remains were washed down old river channels and deposited at what is now the sanctuary. To learn more about gearcharological and paleontological research at Gray's and J-Y Reefs conducted by Dr. Ervan G. Garrison, a professor in the Geology and Anthropology Departments of the University of Georgia (UGA) click, here. An ever growing number of scientists have been working on the 36,000 year old gray whale mandible (jawbone) found by the University of Georgia's Dr. Scott Noakes at JY Reef near Gray's Reef. Prior to this discovery, no known evidence of gray whales had ever been documented offshore Georgia. After two years and numerous dives, the mandible was recovered from the seafloor in sections totaling approximately 1.5 m in length. The mandible was sent to Emory University's Carlos Museum in Atlanta, Georgia for reassembly and conservation. During this time, several Emory and UGA student interns gained valuable hands on experience in conservation practices. Due to the importance of the find and the desire to display and generate interest in the Atlantic Ocean's whales, the Smithsonian National Museum of Natural History (SNMNH) offered to make multiple quality casts of the mandible. The casts will be displayed on the UGA campus; UGA Marine Extension on Skidaway Island, Savannah, GA; and the Georgia Aquarium in Atlanta. The SNMNH will retain one cast for their research efforts on the now extinct Atlantic gray whales. The original mandible is currently being used as a model for students in UGA's Scientific Illustration department in the Lamar Dodd School of Art to prepare the casts for display. To learn more about the discovery, excavation and conservation of the Atlantic gray whale mandible, click here. Today, the rocky ledges can be as tall as six feet but lie under 60 to 70 feet of ocean water. The rocky ledges are complex - they have nooks and crannies, and caves and bumps that provide plenty of places for invertebrates (animals without backbones) to latch on to or hide in. Those invertebrates provide food for many fishes that also shelter in the cracks and crevices, or that hover above the reef. The rocky places provide a firm base for a variety of invertebrates that live their lives permanently attached to the rock. These animals include bryozoans (moss animals), ascidians or tunicates (sea squirts), sponges, barnacles, and hard-tubed worms. These animals form a dense carpet of living creatures that in places completely hides the rock. That gives the habitat of Gray's Reef its name - "live bottom".